5.0Read full review in the 2013 March issue of InD'tale Magazine. Vikki’s Musings4.5 StarsThis is the second book I have read by Laurie White. When I found it available through Kindle Unlimited, I immediately borrowed it. Ms. White writes exciting romantic suspense filled with plenty of sexual tension between the main characters. Desert Heat delivers and more than met my high expectations.Julia Alvarez is desperately trying to find a new cancer drug with her partner on the project. When he ends up murdered, and all their work stolen, she knows she is in danger as well. The detective assigned to the case is none other than Max Reilly, a man she had a huge crush on back in high school, but since he was a jock, he never gave her any attention.As they search for her partner’s murderer, the attraction between them becomes combustible. Should she give into the passion, or stay focused on the investigation? 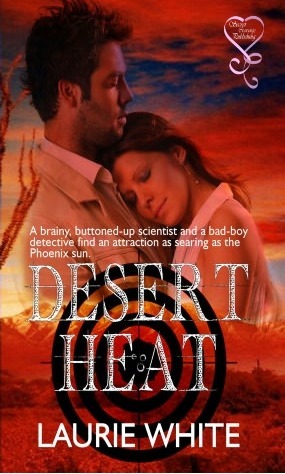 After all, how could a nerdy scientist and a gorgeous cop have anything in common?Desert Heat is fast-paced with plenty of action from the first page, which pulled me into the story immediately. I always love that when it happens! The plot is intriguing and fully developed. Julia’s character was easy to like. She is loyal, dedicated and loves her family. Her determination to find a new cancer drug that would help her mother shows her character in a great light. When faced with life and death situations, her concern is for others rather than herself.Max Reilly is a great hero. He is drop-dead good looking, a strong alpha-male and truly wants to protect people. While he was the jock and Julia was the nerd, he recalls her fondly and responds to her physically. His honor tells him it’s a bad idea to give into the attraction, but his heart believes otherwise. Wow! The chemistry between Julia and Max is fantastic. Ms. White slowly builds the sexual tension one tantalizing scene at a time, leaving me panting for them to at last fall into each other's arms. This is by no means a bad thing; it makes this book an awesome read.If you enjoy a story with high suspense, great characters, and an intriguing plot, then you will love Desert Heat as much as I did. I highly recommend this great love story, and once you’ve read it, you’ll be eager to read her other books. Happy reading! check out this review or others at:www.Twinsietalk.blogspot.comwww.facebook.com/[email protected] received this book from the author for an honest review.Well I must admit that I love this authors ability to cause sexual tension. She has a great ability to make you feel that sexual chemistry. I have read another book of hers called Twist of Fate and I abso loved it. So this story is about a nerdy scientist who gets caught up in a plot from bad dudes to steal a cancer drug she has been working on. Her lab partner is killed and in rolls hawtie detective Max. Apparently Max and Julia went to school together BUT she was a nerd and he a jock...never the 2 did mix.Julia keeps getting attacked, driven off the road and even has her house shot up before Hawtie Detective tells her that they are going to hang........at the safe house...together....alone *wiggles eyes* you sooo know what is gonna happen right??? The 2 characters have an attraction to one another from the moment they meet. She thinks she is still in HS and no way he would be interested in nerd girl her. He knows she is loaded AND the daughter of the mayor WHO KINDA HATES HIM and so no way she would wanna hook up with a loser like him. Hook up they do my friends...steamy and yummy until the damn phone rings. Why do people not turn their cell phones off or better yet, DON'T ANSWER THEM!!!!! Well they continue to investigate who who trying to kill Julia AND her family . When *Dramatic Music* she is kidnapped and Max has to save her. I am going to cut my store there because I want you to read it.....It is a great suspense book. Again I had zero clue who the "Bad Guy" was and was pleasantly surprised. I defo look forward to reading more by this author. This romantic suspense is well-written with a tight plot.Full review in March 2013 issue of InD'tale Magazine.